A Highlands father has become very popular with his children after building them the ultimate chill-out zone. Former Royal Engineer Stephen Finn utilised his skills - and the wintry weather - to construct an igloo in the back garden of his house in Roybridge, near Fort William. It took him eight hours to complete the snowy structure. And he believes it is so strong, it might last well into the new year. Stephen's wife Melissa said it all came about when the snow stopped her husband getting to work. She said: "He can't sit still and he is always building stuff for the kids. "They asked him for a snowman and he said he was going to make an igloo!" Mr Finn, 27, had bricklaying skills from his army days and started packing snow bricks into a plastic box, making about 80 of them. 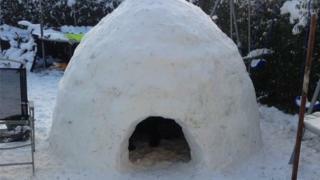 By the time the igloo was completed, his children, Eva-Mae, 10, Vito, 4, and Michael, 2, were delighted. "Vito gets up at about six in the morning and he asks to get his shoes on right away to go and play in it", said Mrs Finn. "All the kids' friends have been round too - we've become a local attraction." People keep asking Mr Finn what he is going to build next. And even his wife fears there could be more snow buildings on the way. "It's snowing again today, so I can see him heading outside and giving the igloo an extension."